GMA Kapuso is starting 2018 with an exceptional musical treat as it brings to the regions a ground-breaking concert series featuring the powerhouse trio of Asia’s Songbird Regine Velasquez-Alcasid, Asia’s Balladeer Christian Bautista, andAsia’s Pop Sweetheart Julie Anne San Jose. 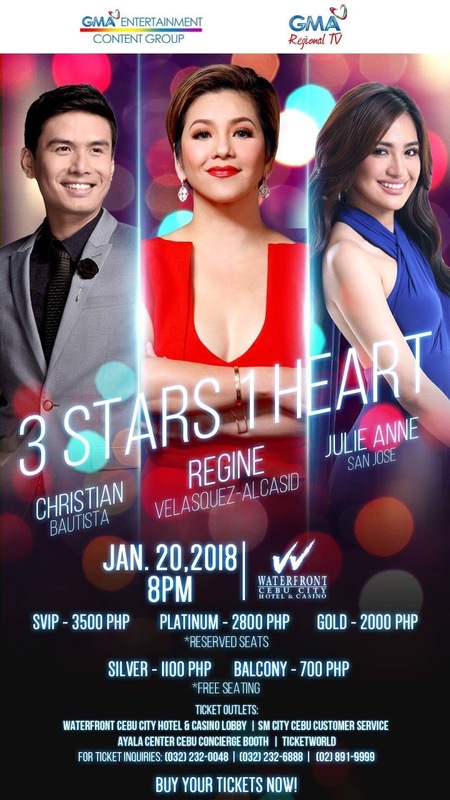 Dubbed “3 Stars, 1 Heart”,this unique musical experience is a collaboration of GMA Regional TV (GMA RTV) with GMA Entertainment Content Group for a concert series in the regions. The first show will be held on January 20, 2018, 8 p.m. at the Waterfront Hotel and Casino, as part of the celebration of the Sinulog Festival. Regine, Christian, and Julie Anne will showcase their prowess in their respective genres in one spectacular onstage experience. Expect the Songbird to mesmerize the crowd by singing the biggest and most-vocally challenging hit songs. Complementing Regine’s glamorous performance is a fashion show featuring a long gown collection of a local fashion designer. Known to be a master of sweeping his audience off their feet, Christian will surely charm his way through a mix of classic and current love songs that everyone could relate to. And to celebrate Cebuano music, Christian will be joined by a local singer in one of his numbers. Julie Anne, on the other hand, will give Cebuanos a show par excellence with her powerful song and dance renditions. Performing with her are Cebu’s homegrown hip hop dancers. After Cebu, “3 Stars, 1 Heart”will have another leg on April 14 at the CSI Stadia, Dagupan City during the Bangus Festival.